FLY LEAF SLO registers Maintain in CFMS - DTA Instructions : Circular Memo:H5 Maintain of Fly Leaf and SLO Register wef 1.4.2018 even in CFSS for effective Establishment Audit, Circular Memo: H5 Maintain of Fly Leaf and SLO Register wef 1.4.2018 even in CFMS for effective Establishment Audit. డైరెక్టరేట్ ఆఫ్ ట్రెజరీ డిపార్ట్మెంట్ నుండి ఆన్లైన్ లో CFMS ద్వారా బిల్లులు పాస్ చేసే ముందు FLY Leaf/SLO రిజిస్టర్ నందు నమోదు చేసిన తరువాత బిల్లులు పాస్ చేయాలని ఆదేశాలు. AP Cir.Memo.No.H5/7668/2015 dt: 22/11/2018 Sub:T&A dept: Treasury Procedure-Maintenance of FLY leaf and SLO Registers w.e.f 01-04-2018 even in CFMS for effective Establishment Audit -Instructions - Reiterated- Reg. It is once again reiterated that before passing of online salary bills in CFMS, entries are to be made in the SLO Register/FLY leaves of employees relating to that establishment without fail until further orders. Personal attention of DDs of (13) districts Treasuries in the state is drawn to the above subject. They are aware that as and when Pay bills/Supplementary bills of employees are passed in HRMS, they are passed only after making relevant entries in SLO Register/Fly leaf of the employees. CFMS have been introduced w.e.f 01-04-2018 and the practice of physical bills is totally dispensed with. But Postings/entries in SLO Registers/Flyleaf required under effective establishment audit/cadre confirmation has not been dispensed with even in CFMS w.e.f 01-04-2018. 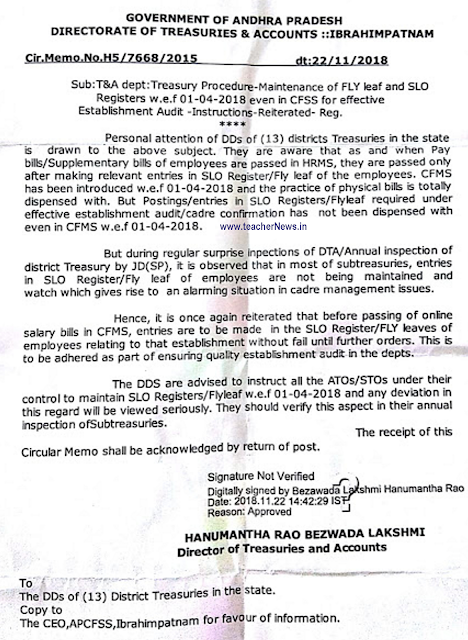 But during regular surprise inspections of DTA/Annual inspection of district Treasury by JD(SP), it is observed that in most of sub-treasuries, entries in SLO Register/Fly leaf of employees are not being maintained and watch which gives rise to an alarming situation in cadre management issues. Hence, it is once again reiterated that before passing of online salary bills in CFMS, entries are to be made in the SLO Register/FLY leaves of employees relating to that establishment without fail until further orders. This is to be adhered as part of ensuring quality establishment audit in the depts. The DDS are advised to instruct all the ATOS/STOs under their control to maintain SLO Registers/Flyleaf w.e.f 01-04-2018 and any deviation in this regard will be viewed seriously. They should verify this aspect in their annual inspection of Sub-treasuries. The Receipt of this circular memo shall be Acknowledgement by return of post. Maintain FLY LEAF SLO registers in CFMS Cir Memo 7668 DTA Instructions, FLY LEAF SLO registers Maintain in CFMS - DTA Instructions Download. Telangana State Public Service Commission is the responsible body to release the hall ticket of TSPSC Recruitment. Candidates who have applied for the examination shall have to download the admit card for appearing in the examination. TSPSC releases the application form in online mode only so that one can submit easily apply for the released recruitment. TSPSC Hall Ticket will be release before few days of the examination.